New to the fandom or just trying to wrap your head around over 50 years of history? The X-Men universe is notorious for being extremely convoluted, with multiple titles, alternate timelines, and crossover story arcs. It has been quite a journey for me as a collector, and I wanted to share this reading guide I have put together. Click on the guide below to enlarge to full-size; it’s enormous, trust me. I try to arrange titles and sections in a logical chronological reading order. The mainstream universe, known as 616, has titles divided among these sections on ScottandJean.com: The Original Five, X-Men: First Class, Uncanny X-Men, X-Factor, X-Men, Miniseries, All-New X-Men. 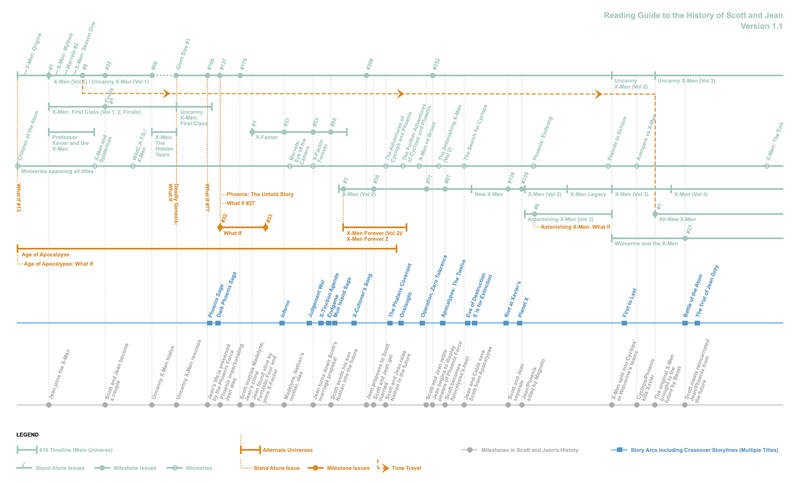 See the chart below for a rough distribution guide for the section reading order. You may have to jump between sections from time to time, but story arcs are usually linked issue to issue for continuity. Alternate universes may branch out from the 616 universe, or exist without reference to 616. What If & Alternate Realities contain some titles that branch out from 616 (refer to the reading guide above). The following are stand alone alternate universes that can be read independently: 1602, Ultimate X-Men, X-Men Mangaverse. The movies and most of the animated series/cartoons are loosely based on the 616 universe, but need no prior knowledge of 616. X-Men: The Animated Series follows the 616 universe most closely, borrowing majority of the storylines from 616. X-Men: Evolution is generally considered an alternate universe. Wolverine and the X-Men and Marvel Anime: X-Men are loosely based on 616. The X-Men Movies are based on 616 but have gone on to develop their own canon universe, and in turn influenced the 616 universe. *See a mistake in the reading guide? Please let me know! This reading guide is a work in progress and will constantly change with the ever evolving X-Men universe. X-Factor #36: Inferno Pt IV: Transformations! X-Factor #38: Inferno Pt VII: Duet! Uncanny X-Men (Vol 2) #243: Inferno Pt VIII: Ashes! X-Factor #86: X-Cutioner’s Song Pt X: One of These Days...Pow! Zoom! Uncanny X-Men (Vol 2) #392: Eve of Destruction Pt I: From the Ashes of the Past...Still Another Genesis! 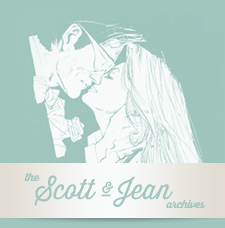 Have questions about Scott and Jean? Email them!